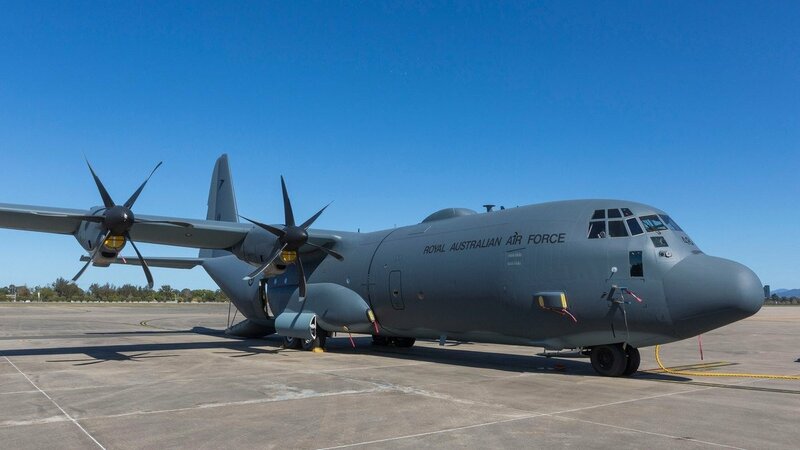 MELBOURNE, Australia — Australia is undertaking a series of upgrades to the Lockheed Martin C-130J Super Hercules airlifter, improving connectivity, fuel payload and surveillance capabilities with the addition of new equipment. Working together with industry, the Royal Australian Air Force, or RAAF, has installed a wideband satellite communications system and is planning on fitting Litening pods onto one of its C-130J used as a capability demonstrator aircraft. RAAF is fitting external fuel tanks on its C-130J fleet. Group Capt. Tony Bull, director of capability development and transition at the RAAF’s Air Mobility Group, told Defense News at the ongoing Avalon Airshow that these modifications are part of the RAAF’s Plan Jericho umbrella, which seeks to transform the service into an integrated and networked 5th-generation Air Force. The SATCOM suite features Honeywell’s JetWave Ka-band satellite communications hardware and Inmarsat’s Global Xpress satellite network. Since it was fitted onto the Jerich Demonstator C-130J in 2017, the suite has successfully demonstrated its ability to use a number of secure military applications that previous technology couldn’t enable due to bandwidth restrictions, including live video streaming and encrypted file transfer. According to Bull, the SATCOM system allows personnel on board to be linked with command elements and forces elsewhere, improving their situational awareness even while in transit and allowing missions to be replanned, to assess the battlefield environment. He said that the SATCOM trials have now proven the concept, and the program has since transitioned into a RAAF minor project with the intention being to eventually fit all of the RAAF’s 12 C-130Js with the SATCOM capability. This SATCOM capability has not gone unnoticed by the U.S. Air Force, with personnel from Yokota Airbase in Japan, who also operate the C-130J, saying they were impressed by the capability when they encountered it during their interactions with the RAAF. Bull also added that the plan to fit the Rafael/Northrop-Grumman AN/AAQ-28 Litening pod to the C-130J demonstrator, which was revealed recently, will allow the C-130J to conduct surveillance of a target area. He gave the example of its potential use during disaster relief operation, with the pod being able to provide vision of a target area. Forces could then assess needs from either on board the aircraft, or use the SATCOM to stream video to a command or headquarters element elsewhere, and make decisions based on the situational awareness provided. These capability improvements are meant to enhance the C-130J’s primary role as an airlifter, however, and the RAAF has no intention to expand the C-130J’s missions into that of a surveillance aircraft, for example. Australia has a number of surplus Litening pods as it starts the withdrawal of its F/A-18A/B Hornet multirole fighters over the next few years. The pods were acquired by Australia in 2008 as part of its program to upgrade its fleet of Hornets. Bull also touched on the installation of external fuel tanks onto the C-130Js, with five sets of external fuel tanks now available for use on the C-130Js. In addition to extending the range of the airlifters, the tanks could also be utilized during the forward arming and refuelling point or FARP operations to offload fuel without having to sacrifice the C-130J’s own internal fuel capacity or carry it in its main cabin. This frees up space in the aircraft to carry other cargo. These modifications to the RAAF’s C-130Js are being conducted in conjunction with Airbus, which is also responsible for providing through life support for Australia’s C-130J fleet. The company, which has supported the fleet since 2009, signed a rolling contract in late 2018 to continue the work for an additional six years through to 2024.